Songkran mayhem in Chiang Mai. In an effort to shorten up the writing on my Travelog Thursday, this week I will just give a brief description the special and famous three-day holiday in Thailand called Songkran. It is the Thai New Year celebration and kicked off every April 13th and ends April 15th through all of the regions of Thailand. Wat Chedimon celebrating Songkran which bases off of the religious holiday of cleaning the temple and Buddha statues. It is the country's most popular and fun holiday, as the entire country takes the three days to rejuvenate and start a new year on a fresh foot. Such a fresh foot that all of the harmful things we carry with us each day are to be literally washed away with chalk powder and water. A cleansing of the soul in some sorts. So for the three days, the country holds what could be best described as a massive, country-wide waterfight. Several other countries celebrate similar holidays or traditions with water, but Thailand is known for this incredible celebration. Everyone is a target to splash water on, not out of revenge or spite or anger, but because it is to give you good luck and wash all of the bad things in your life away. 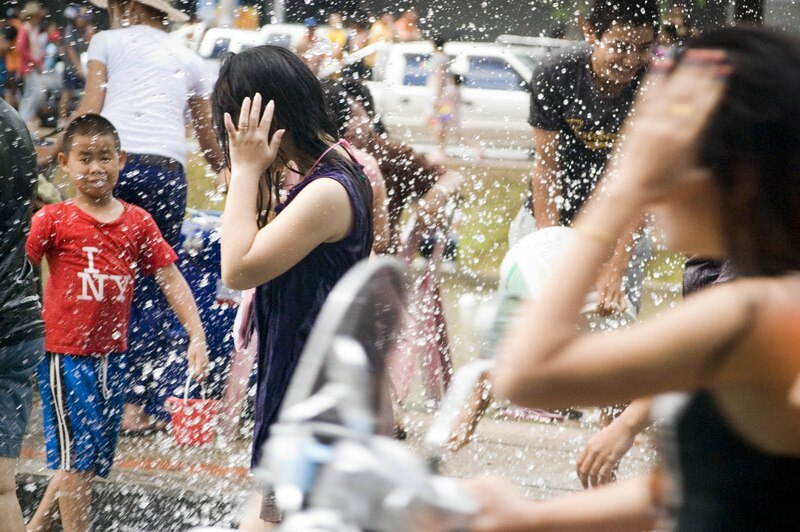 So when that stranger dumps a bucket of ice water over your head, they really are doing it out of celebration of the new year, AND they are actually helping you cool down as mid-April is the hottest time of the year in Thailand. Phantom splashes surprise this young girl. This songtaew (local taxi truck) drove by me and splashed me as it pulled around the corner. When I looked up, I saw a bunch of smiling monks looking back at me with suspecting smiles. That was a really beautiful experience, being involved in the holiday with even the monks finding a little fun in the water festival. Many dispute over where to celebrate the holiday; some say at temple, some say in the Silom district in Bangkok, other think Chiang Mai is the best. Wherever you are from April 13-15, you must be prepared to get soaked. My very first experience with Songkran was in Bangkok, just after arriving back from China, literally minutes after dropping my bags off in my apartment, I went to 7-Eleven to get something to drink. Before I knew it, the two store clerks whom I had probably tormented for the past year in my late night drunken snack requests got their "revenge" but in the sweetest manner. As I was standing in front of the refrigerators deciding what I wanted to drink, one of the clerks came up behind me and pour an entire cup of ice water down the back of my shirt, which the biggest smile on her face and the cute words spliced with tremendous laughter, "sawadee pi mai!" 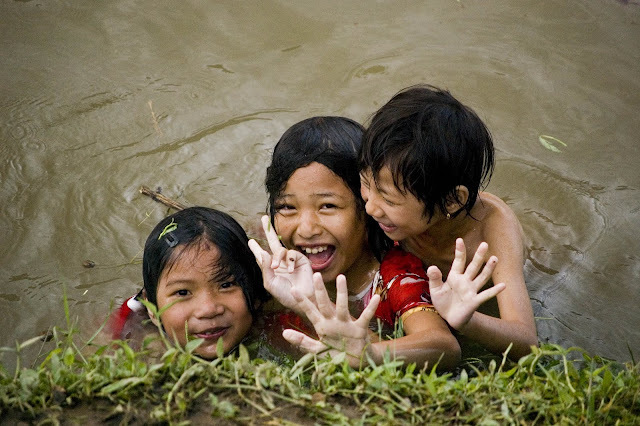 A greeting many give to each other when splashing water on them, literally meaning "Welcome the New Year!" Or simply "Happy New Year." So as I was shocked by how open and easy going this celebration was, I went over to the soda fountain and got a Big Gulp cup, filled it with ice and water and began chasing the two employees around the store tossing water on them and all over the store. They LOVED it! We presumed to have a fairly extensive waterfight in the middle of the store (with other customers as well). 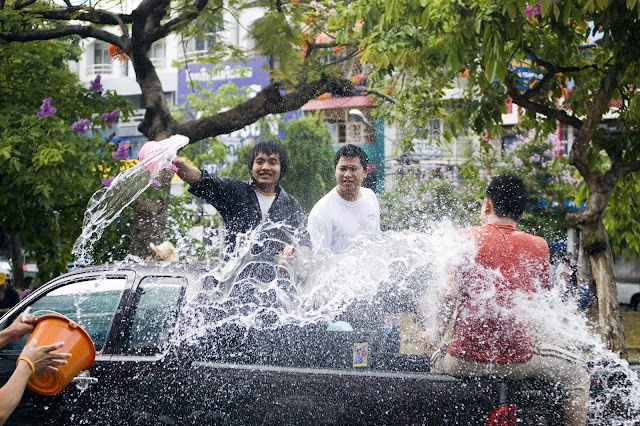 That first interaction with Songkran is one that will never leave me, as it was just so purely care-free and innocent. This little girl attacked anyone who came close with her mini soaker gun. Later that day I caught a flight up to Chiang Mai to meet up with friends already there to celebrate with them. 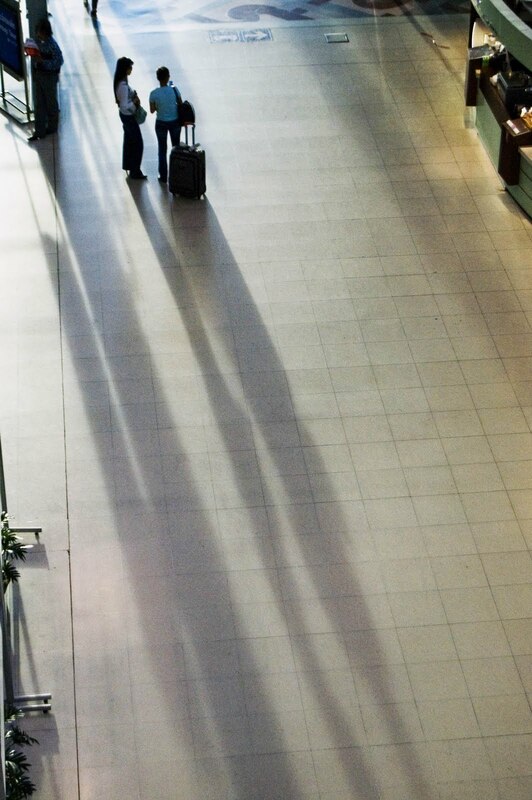 The airport was maybe the only place where peace ensued. No waterfights at the security line, no buckets of water dumped at the ticketing booths. But just outside the airport, police officers, taxi drivers, and street vendors all were splashing each other with water. The mania was incredibly universal (aside from the boring airport, ha). The only sane place during Songkran in Thailand, the Suvarnabhumi Airport. Boring. My three days there were amazing. 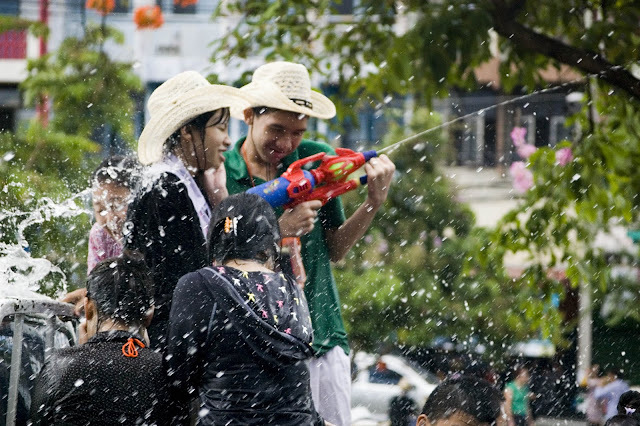 Chiang Mai has a lot of tradition in Songkran's history and brings in thousands of people each year for the holiday. The ancient city is literally surrounded by a moat of river water and what do you know, EVERYONE uses it to their advantage in splashing people. The entire day is just constant raining down of water, and when it is hot outside, it all feels the same eventually. But some very smart marketers began to sell ice for 20 Thai baht. The trick was to save your icy cold water for people that you know will get a reaction out of it. The water was meant to really surprise and shock your target, so as my friends and I walked along the road inside of the moat of water, we drank some beers, sprayed some icy water on people and watched as the entire country lived up to its name of "The Land of Smiles". When you look at my photos, you'll see, there is not one person who is not having the time of their life. It is truly incredible. It was (and is) my all-time favorite holiday. So take a look at some of my photos and maybe lightly splash someone with a bit of water today and explain to them the tradition. The worst that could happen is they get upset by it, the best is that you start your own mini-Songkran waterfight. Sook san wan Songkran lae chok dee ti pi mai! This guy meant business. Spraying drive-by bikers and waiting for his dad to get some more ice cold water to toss. Three young girls enjoy a dip in the moat water and give a wave after splashing me from below the roadway. They were daring little ones to swim in that water.